People who seek skincare professionals expect the professional will create a treatment and maintenance regimen that has been determined to be effective and safe. Just as a sick subject seeks any healthcare provider, these groups of patients want us to be clearinghouses for scientific information. Yet despite billions of dollars spent in the cosmetic industry, there is a very large deficit in efficacy and safety data simply because it is not required by a regulatory agency. But is it not a provider’s moral and ethical obligation to make treatment decisions for those seeking our care? The drive for evidence-based medical decisions points in that direction for all healthcare providers including skin care professionals. This discussion will focus on herbal products for medical and cosmetic uses. An example of unique herbal product complying with criteria for evidence-based medicine will be presented. There is an FDA-approved green tea catechin extract for therapy of warts. 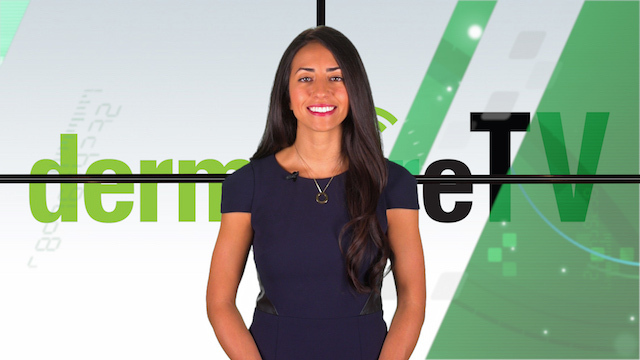 The FDA has approved herbal-containing barrier device topicals—one containing sweet almond oil and another utilizing licorice extract. There is a wart treatment used in dermatologist’s offices that contains may apple extract (podophyllin) and white willow bark. These few products have documented at least some measurable clinical activity and safety to the FDA. Nearly 1,200 and a growing number of extracts from botanicals are used in the cosmeceutical industry to improve the appearance of the skin. Close to 15,000 different plants provide these. Yet, another more than 235,000 plant species have not been significantly investigated for potential mammalian use. Botanicals used to provide extracts for medicinals, flavoring, and fragrance are known as herbs. To determine efficacy of an herbal-based product, a double blind, placebo, or prescription product control in a prospective design using using the final marketed product in its packaging requires a human clinical trial. These clinical trials should be conducted by a registered third-party contract research organization after approval by an institutional review board. The trial must include enough subjects to achieve statistically significant data with proof of efficacy achieving p value <0.05. Contact dermatitis is the most common adverse reaction to topical herbs. A Repeat Insult Patch Test is the most cost effective method to assess this. To prove safety, this test measures both irritation and sensitization reactions in 50 subjects. Yet, it usually costs less than $5,000. Thus, lack of this data for marketed products cannot be justified for products sold by “wholesalers with integrity.” The safety data is important because 24 herbs applied topically produced fatalities. Chinese practitioners have documented one-third of topically applied herbs not only induce contact dermatitis but also display teratogenicity and hepatotoxicity.2 Other nonfatal severe reactions to topically applied herbs include anaphylaxis, urticaria/angioedema, exfoliative erythroderma, lupus, bullous dermatoses—including Stevens-Johnson, Sweet’s Syndrome, vasculitis, and erosive mucosal disorders.3 Thus, a provider must not assume nor convey to patients that a natural or herbal product is safe if no safety trials have been conducted. A provider should be particularly cautious of selling cosmeceuticals that cannot document any efficacy nor safety. Published efficacy of the above clinical trials is uncommon regarding functionalities that may be utilized in reversal of mucocutaneous diseases or abnormal skin conditions. More than 220 different herbal extracts have demonstrated anti-inflammatory effect in vitro. 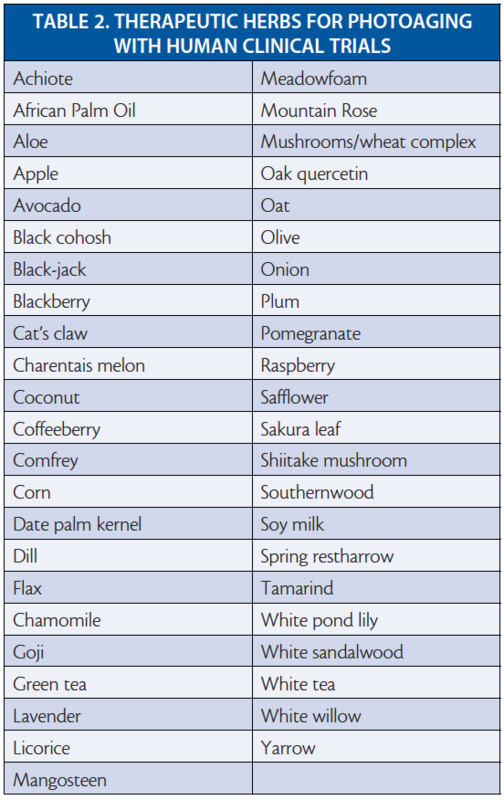 About 150 of these also provide antioxidant effect in vitro. 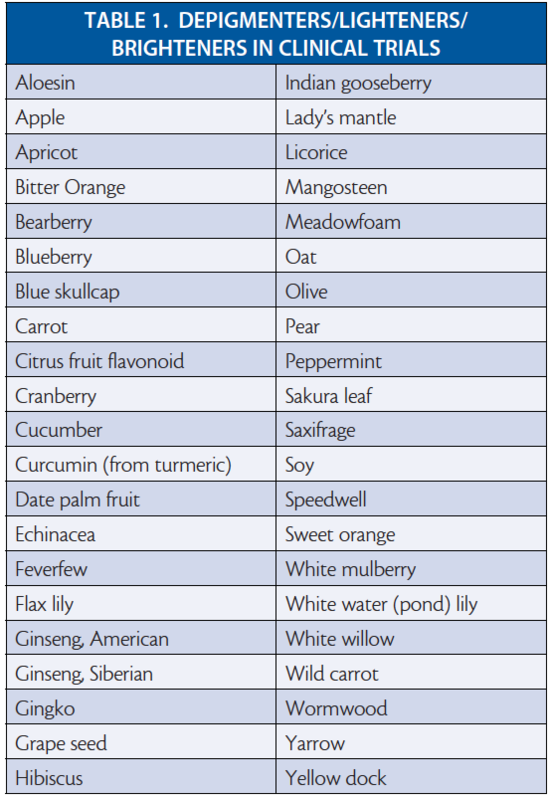 More than 140 herbal extracts inhibit melanogenesis in vitro yet only 44 demonstrate reduction of hyperpigmentation in blinded human clinical trials (Table 1). 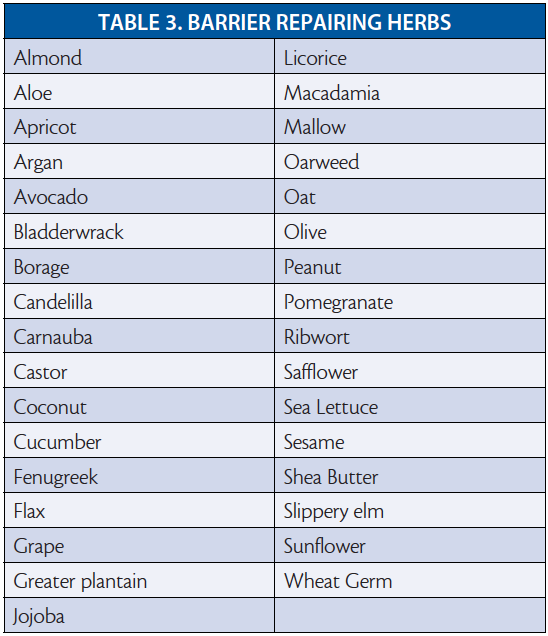 The 45 herbs that have demonstrated efficacy in blinded human clinical trials to treat photoaging are listed in Table 2. Yet hundreds claim to reverse photoaging. 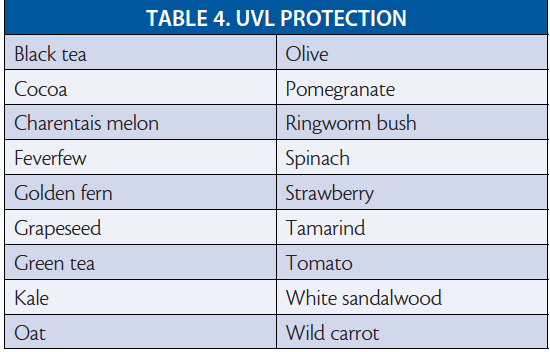 The 71 herbs that repair stratum corneum permeability barrier function are listed in Table 3 and 18 herbs with ultraviolet photoprotection are listed in Table 4. 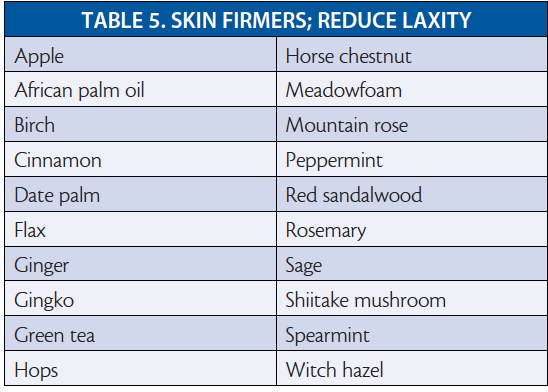 The 20 herbs that firm skin and reduce laxity are listed in Table 5. 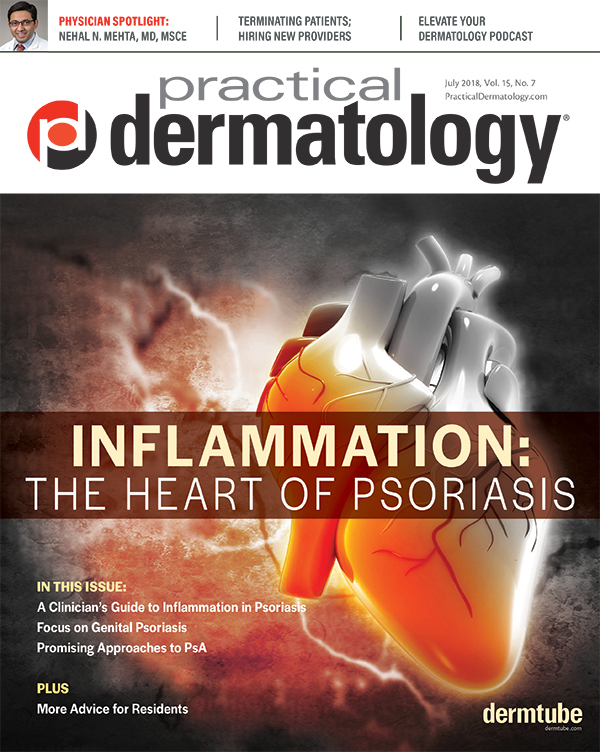 Even though herbal extracts may contain multiple “active” ingredients the key issue is whether it has high enough (therapeutic) concentrations of any of the actives to modulate any or all of the seven mucocutaneous pathways of inflammation or the five barrier repairing pathways or the 20-steps in melanogenesis among others. Moreover, for a product to be effective for months or years of use, tachyphylaxis—or resistance—must be mitigated. Using two different actives to modulate each pathway or pathophysiologic step dramatically prolongs duration of product usage by reducing tachyphylaxis by >90 percent. The most important sign of photoaging to the public is visible wrinkles. These have been documented to result from chronic epidermal inflammation that upregulates dermal matrix metalloproteinases (MMPs). 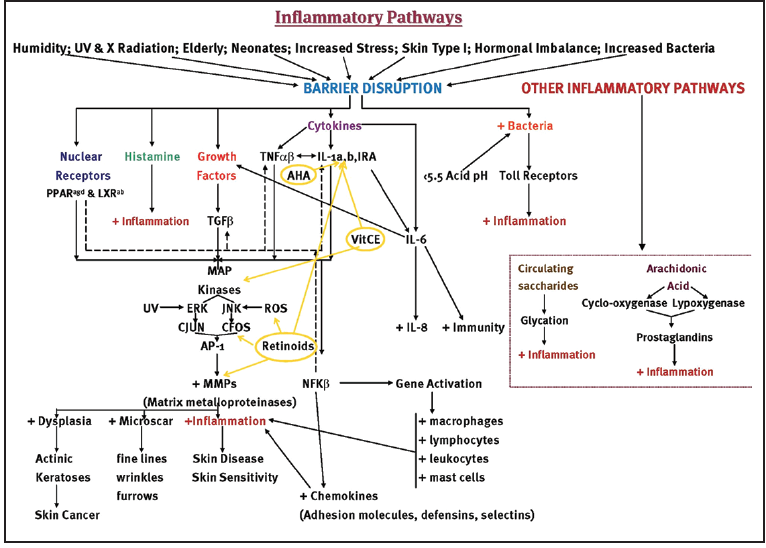 Five inflammatory pathways in the epidermis induce an imbalance in multiple MMPs and their Tissue Inhibitors (TIMPs) that results in destruction of collagen, elastin, and extracellular matrix components (Graph 1) inducing microscars that expand to fine lines, wrinkles, and furrows. Disruption of the stratum corneum permeability barrier for any reason activates epidermal inflammation. It is also known that inflamed and rejuvenating cells have higher metabolic rates. This results in the depletion of the 23 vitamins required for normal metabolism of the epidermal shield, which consists of five strata: corneum, granulosum, lucidum, basale, and basement membrane zone, as listed in Table 6. A blend of nine botanical extracts, not commonly recommended in anti-aging literature, provides these 23 vitamins at therapeutic concentrations to effectively deliver into the targeted epidermal strata or cell. A product utilizing this botanical blend was documented to reverse course and fine wrinkles to a highly statistically significant (p<0.001) degree within one week in two blinded clinical trials. One trial compared it to an antioxidant (AO) blend product based primarily on Vitamin C, and the second trial to a product with multiple growth factors (See sidebar). This herbal blend serum provides the functionality of therapeutic concentrations of these nutrient groups, without the pro-inflammatory and barrier destroying properties associated with excessively high concentrations of these vitamins. The blend also enhances anti-tumor and anti-microbial effect. Dr. Thornfeldt is on faculty for Cosmetic Surgery Forum. Cosmetic Surgery Forum 2018 will be held November 28 - December 1 at Cosmopolitan, Las Vegas. For information, visit cosmeticsurgeryforum.com. 1. Thornfeldt, C, Borne, K. The New Ideal In Skin Health: Separating Fact From Fiction. Carol Stream, IL: Allured; 2010. 2. Thornfeldt, C. Botanicals. In Draelos, Zoe, ed. Cosmetic Dermatology: Products and Procedures. 2nd ed. Hoboken, NJ: Wiley & Sons, Ltd.; 2016: 283-294. 3. Thornfeldt, C. Cosmeceutical Botanicals. In Draelos, Zoe, ed. Cosmeceuticals. 3rd ed. Philadelphia, PA: Elsevier; 2016: 55-64. Shiitake mushroom provides vitamin A, B, C, and especially D and cellular immune stimulating beta glucan. Antimicrobial due to nucleic acid inhibition. Inhibits elastase activity, resulting in skin firming. Increases delivery of other specific actives via fatty acids. It is also anti-inflammatory (AI). Bidens pilosa extract (Spanish needle) provides all four tocotrienols and three of four tocopherols. African Oil Palm (Elaeis Guineensis Palm Oil) is known for wound healing properties help with the synthesis of collagen and elastin fibers. It also contains iron, the required cofactor for ascorbic acid to hydroxylate proline and lysine for collagen synthesis. Cucumis Melo (Charentais Melon) Fruit provides precursors for vitamin A and B synthesis and provides both ascorbic acid and dehydroascorbate, which is required for AO effect of vitamin C. It increases SOD to 6,000 and increases photoprotection by 70 percent to UVA and 40 percent to UVB. AI, AO. Flax (Linseed) provides AI, barrier repairing omega-3 and omega-6 lipids plus antimicrobial effects to reduce pathogenic microbes. Bixa orellana (Achiote or annatto) and Raspberry provide gamma tocopherol, tocopherol succinate, and linoleate, plus tocotrienols. Gamma tocopherol provides the most AO and AI function of all tocopherols plus has antitumor functionalities, but not provided in any other herbs. Yarrow (Achillea millefolium) contains volatile oils such as camphor, alkamides, polyynes and betaines. Lightens skin. Yarrow assists in transport of difficult to deliver compounds by providing transferosomes. After one week of use, HB serum was highly statistically superior (p<0.001) for improving wrinkles compared to a marketed antioxidant blend product containing vitamin C. HB was statistically significantly superior (p<0.05) to the AO product for improving fine lines, texture & roughness as well. After 1 week of use, HB serum was highly statistically superior (p<0.001) for improving wrinkles over a marketed growth factor serum. HB was also statistically significantly superior (p<0.05) for improving fine lines, texture, roughness & pore size over the growth factor product. Clinical study data at eight weeks combining the two studies revealed the superb results of HB’s efficacy as listed in the Table. The safety/tolerability of the herbal blend was significantly better than both marketed products, since it had no moderate irritation reactions. HB serum was preferred by 78 percent of the clinical trial subjects in combined results of both trials. This unique blend of nine herbal extracts that together provide all 23 vitamins required for normal metabolism of all epidermal strata is significantly more effective in reversing photoaging signs than antioxidant or growth factor products.